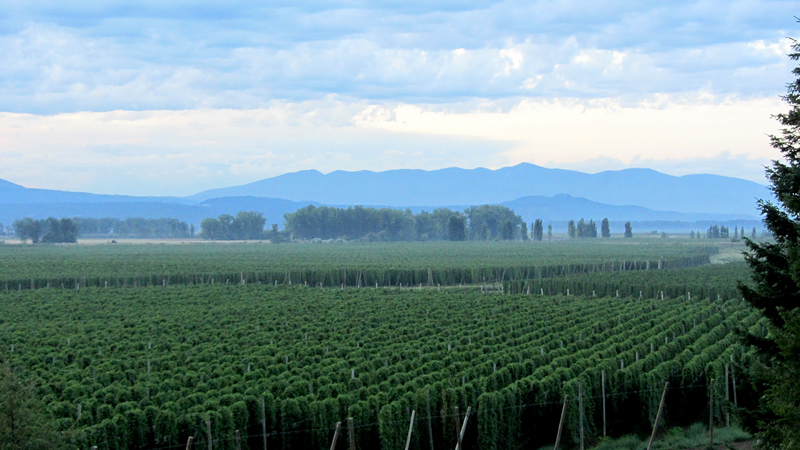 Elk Mountain Farm in Idaho has more than 1,700 acres of hop bines. Photo by Aubrey Laurence. Just 10 miles south of the 49th parallel and the U.S.-Canada border, Elk Mountain Farm is one of the world’s largest hop farms. Here, more than 1,700 acres of hop bines climb 18-foot strings of twine. When they reach the cables at the top, which are suspended tightly by a network of 20-foot-tall wooden poles, they pour back down like lush-green waterfalls. 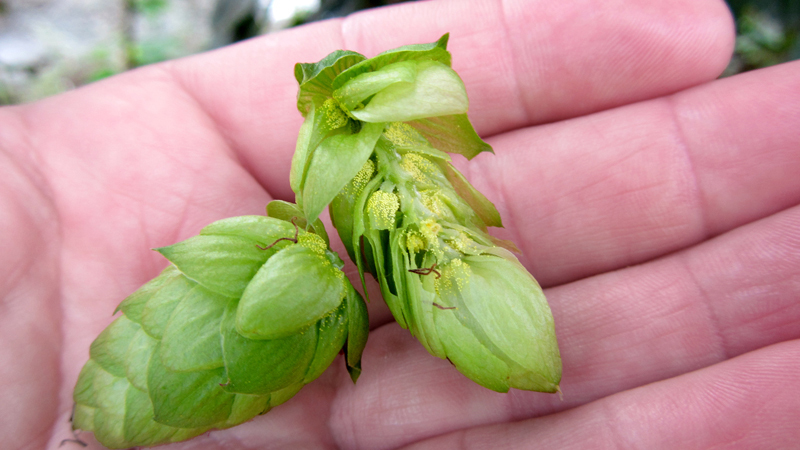 The hop plant, or Humulus lupulus, is an extremely complex organism that is made up of hundreds of compounds, many of which are not entirely understood. It is a crucial ingredient in beer, contributing not only bitterness, flavors and aromas, but also to head retention and mouthfeel; plus it provides an antiseptic quality that helps prevent spoilage. 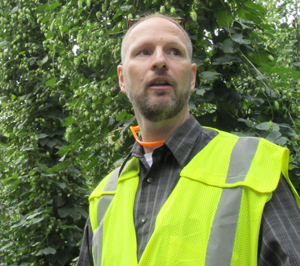 98 percent of U.S. hops are grown in three states: Washington, Oregon and Idaho. Photo by Aubrey Laurence. Roughly one-third of the world’s hops are grown in the United States, and 98 percent of U.S. hops are grown in three states: Washington (74%), Oregon (14%) and Idaho (10%). There are dozens of varieties of hops, with new ones continually being created, and there are a multitude of ways in which brewers can imbue beer with them—from bitterness additions to aroma additions, first-wort hopping to Randallizing, and hopbacking to dry hopping—resulting in endless outcomes. Hops are complicated plants to grow, harvest and process. After many years of breeding and testing for viability and disease resistance, production hops finally begin their perennial lives of sun worship, spiraling up in a clockwise fashion and tracking the sun as it arcs across the sky each day. Hops grow best between the 35th and 50th lines of latitude in the Northern Hemisphere and Southern Hemisphere. These belts provide long summer days with 15 to 18 hours of sunlight, and they have winters that give the plants a much needed dormancy period. Hops can be grown outside of these climate zones, but the yields are typically lower. Anheuser-Busch InBev (AB InBev) purchased Elk Mountain Farm in 1988, and after acquiring Goose Island Brewery in 2011, both breweries now share the bounty of hops that the farm provides, with roughly half of the crop allocated to Goose Island beers. Most of the fields are dedicated to fewer than 10 hop varieties, but the farm is also developing and growing more than 50 experimental varieties. Between the rows of towering hops, the air is still and replete with fragrant aromas of grass, earth and resin. It is a peaceful place, and sounds are muted by the thick foliage. That is, until a clattering and buzzing hop combine churns along. Highly skilled workers carefully maneuver these Rube Goldberg-esque machines up and down each row, chopping down hop plants in the front, pre-processing them to a degree, and then conveying them into a truck that is hitched to the back. There are only 10 hop combines in the world and Elk Mountain Farm owns six of them. 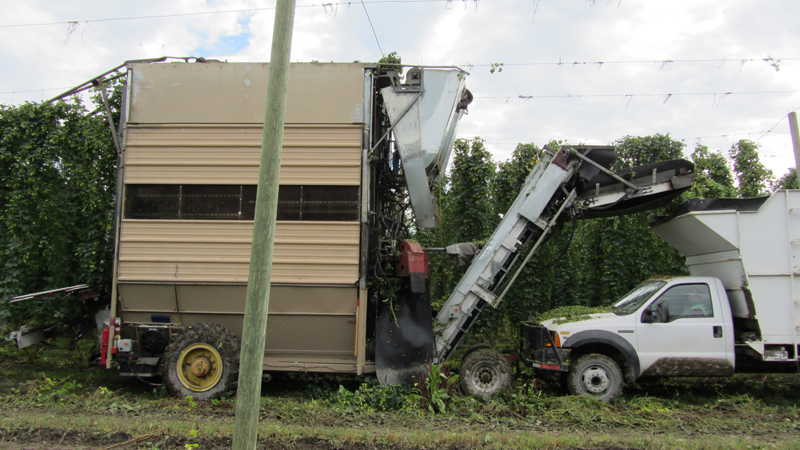 Other hop farms have tried to build and use hop combines, but most have given up on them, as each combine-plus-truck configuration costs $1.5 million, they must be built by hand, and they require specialized operators and mechanics. A hop combine at Elk Mountain Farm in Idaho. Photo by Aubrey Laurence. Ed Atkins of Elk Mountain Farm. Photo by Aubrey Laurence. 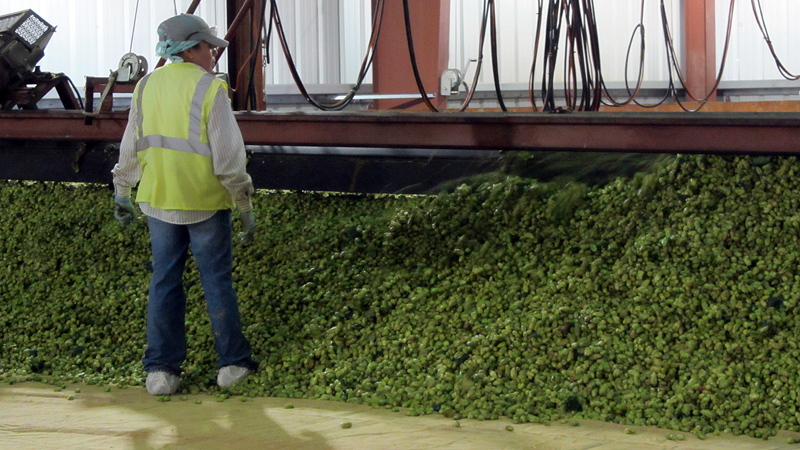 From there, conveyors feed the freshly picked hops into one of eight 32-by-32-foot kilns. Hop beds are slowly built two to three feet deep, from one end to the other, like an oversized 3-D printer. A worker removes any remaining stems by hand. Eight jet-engine-like blowers crank out a total of 70 million BTUs, and they rattle the building as if a train were passing through it. The 130- to 150-degree air is blown into large cinder-block rooms, through the ventilated ceilings and up through the hop beds above. Drying time is based on the hop variety, how ripe it is, its moisture content (plus any rain it might have received), kiln depth and air temperature. Often, hops can be dried within just five or six hours. Kilning hops at Elk Mountain Farm in Idaho. Photo by Aubrey Laurence. Kilning may seem like a simple process, but it’s a rather intricate process that requires years of experience to be able to determine the correct hop depth, air temperature and time, based on the hop variety, its condition and what the brewers want out of it. Atkins says that experienced dryer operators are some of the most sought-after workers on the farm. After kilning, the dried hops are cooled, compressed, wrapped, sewn, weighed, moisture checked and marked. Then the 200-pound bales are shipped to Yakima, WA, to be pelletized and placed into cold storage. If all goes well with weather, equipment and labor, the harvest concludes before the first frost, which usually occurs sometime in September. The workers are passionate and hard working, though, and many return year after year. Just like the AB InBev and Goose Island brewers who visit the farm regularly, the farm workers take hops very seriously, and they understand how critical they are in beer making. As they say, great beer starts with great ingredients, and they go to great lengths to ensure they produce the best hops possible. RELATED: Read a story about wet hop beer. Editor’s Note: Travel, lodging, meals, and beer were provided to the author by AB InBev during the course of reporting for this article. Thanks for the insite, good info. When is the best time to visit?? I would like to visit your farm. We will be in the area later this week or first thing next week. Great read. Looks like an amazing place. What are the 10 primary hops grown at the farm? We have relatives coming to visit in July from Missouri and one of the things they would like to do is visit the Elk Mountain Farm. Are there certain days or times that are best to visit?